Disconnect the variable frequency drive from mains voltage and protect it against being energized unintentionally. Verify that the variable frequency drive is discharged. Wait for some minutes until the DC link capacitors have discharged before starting to work at the unit. When the variable frequency drive is disconnected from power supply, the mains, DC-link voltage and motor terminals may still be live for some time. The VFD cable dimensions must be selected according to the current load and voltage drop to be expected. Select the VFD cable cross-section of the cables such that the voltage drop is as small as possible. If the voltage drop is too great, the motor will not reach its full torque. Comply with any additional national and application-specific regulations and the separate UL instructions. Install two protective conductors of the same size as the mains cable, or one protective conductor of a size of 10 mm². 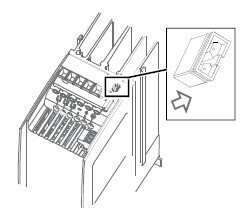 Install one protective conductor of the same size as the VFD mains cable. Install one protective conductor with a cross-section of 16 mm². Install one protective conductor of half the size of the VFD mains cable. The following table provides an overview of typical variable frequency drives cable cross-sections (copper cable with PVC insulation, 30 °C ambient temperature, continuous mains current max. 100% rated input current). Actual cable cross-section requirements may deviate from these values due to actual operating conditions. Please note, that the mentioned typical cross sections do not consider other factors like fuses. Comply with applying local standards and applying branch standards. 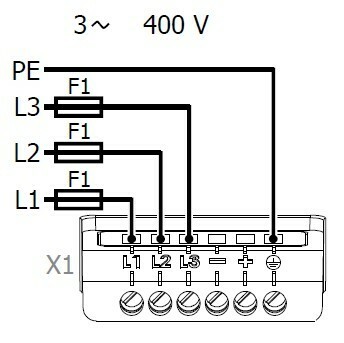 For connection to IT mains, pull out the plug-type jumper. Note: Removing the jumper reduces interference immunity and increases the emitted interference. Interference immunity can be increased by means of external filters. Additional work for EMC conformity may be possible. Comply with the EMC information.